Yes, we have covered tennis events before, highlighted by walking around the grounds of Flushing Meadows at the U.S. Open last year to take in every single match that wasn’t in Ashe Stadium for a couple of days. But covering such a cosmopolitan sport outside of America must be a different experience altogether. At least that’s what I thought initially, and that idea led me to take on this endeavor and consume the game in an area of the world where my native language wouldn’t be the dominant one. So today was my first day in Montréal, which was the second day of the tournament’s main draw. Starting right now, and hopefully ending with the final on Sunday, we’ll have a review of our experiences walking the grounds each day and taking in one of the premier events on the ATP Tour. Rain, Rain, $%^@#*! Go Away! Being in New York City most of the summer, as well as traveling to various cities (e.g. Chicago, Washington D.C.), I don’t think I’ve experienced a drier summer in the Big Apple in all of my years living there. Seriously, it has felt as if it hasn’t rained at all since the beginning of the summer. Or, in other words, a sports reporter’s dream. 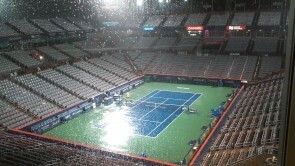 Heavy rain caused the match between Andy Murray and Tommy Robredo to be suspended until Wednesday. So what do I get greeted with the second I pick up my luggage off the side of the Greyhound bus when entering the city, a memory that will last a lifetime reminiscing about the new experience we were about to embark on as a business? As much as I wanted to be upset at the fact that the downpour would delay proceedings at the tennis courts this afternoon, my first thought was this: “How can it be raining? !” I couldn’t even remember the last time I actually held an umbrella, outside of moving it when reorganizing my room the other day. Play was scheduled to begin at 12:30 PM, but that wasn’t happening. Not only that, but I was at my hotel three hours before check-in time, which meant that I had to kill some time. Which also meant I had to, in part, walk around in the rain to kill said time. If you think the beginning of the day was bad, there are thunderstorms in the area as I’m typing this sentence at 12:01 AM. Can I sleep here in the stadium tonight? Between the storms in the morning and late in the night, there actually was tennis played. Really! And some good tennis at that. The skies cleared just in time to watch World No. 1 Novak Djokovic get through a tougher-than-expected contest in his first match of the tourney against tricky lefty Thomaz Bellucci. It was amazing the reception that Nole receives, almost more so for his command of the French language in the post-game on-court interview than for, you know, being the best there is in the game today! But the match afterward was the one I was really intrigued by. World No. 10 Milos Raonic, the hope of a sports-mad nation that’s been forever starved of tennis greats, took the court against the taller, Croatian version of himself, Ivo Karlovic. To be honest, both were pretty much playing their reflection: huge servers, big forehands if they’re in position to hit them, big question marks about the rest of their game. But Raonic is No. 10, reached as high as No. 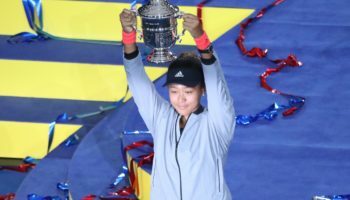 4 in the world just three months ago, and has been tabbed as one of the few players who could break the hegemony at the top of the men’s game in terms of Grand Slam victories. Given that backdrop, my focus was more on how the Montréal faithful would react to him. I doubted it would reach the fervor that surrounds him when he’s in Toronto every other year, especially since he grew up in the province of Ontario. But anything close to what one might hear at a Canadiens game would have been a pleasant sight. What wasn’t pleasant was the match itself (as expected), which resulted in a crowd sitting on its hands more than anything else. Raonic lost the first set in a tiebreak, with the only point that Karlovic lost in that tiebreak coming on a double fault. The second set was more of the same, though Raonic had to save two match points at 4-5, 15-40 to keep the match alive. Another tiebreak ensued eventually, and another Karlovic rout in the tiebreak closed the match out. Neither player was broken in the match, but a related statistic told you all you needed to know about this match: Raonic, although perfect in this category, had to save 10 break point chances from Karlovic, while Dr. Ivo didn’t face a single break point all match. 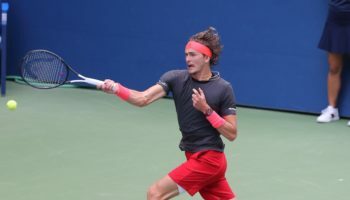 There’s more doubt now as to whether Milos can live up to his potential…and the fans in the stands seemed as if they knew that more than anyone. 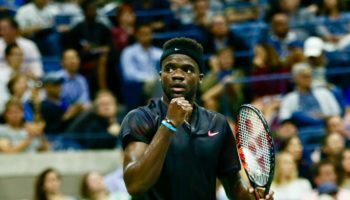 As I was eating dinner in the dining room downstairs and watching Milos Raonic struggle as I watched an oversized monitor, a young man directed his frustration at what he was watching at the television screen…then to me. In French. “Parles vous anglais?,” I had to sheepishly ask as he was waiting for me to affirm his gripes. Fortunately, he did share with me in English what stuck at his craw when it comes to Milos. 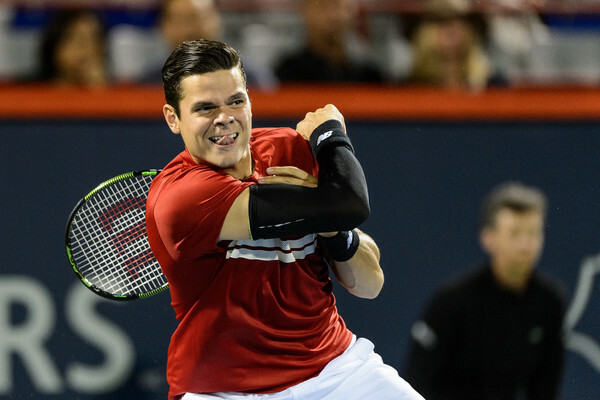 After hearing him, a former youth tennis player in Quebec, state the same issues that many tennis pundits question about Raonic’s game, he ended up speaking glowingly about Canada’s second-ranked player, world No. 45 Vasek Pospisil. Along with his friend, another former youth tennis player, it was interesting to hear them not only talk very lukewarm about Raonic (“I don’t like him, but I don’t want him to lose” was one of the lines said during Raonic’s match) but also be effusive of Pospisil, essentially agreeing that he is the better player as we speak. Also, Pospisil is much more of an emotional player, something that at least a few Canadians, especially the two who engaged me in this conversation, liked about him. They have a point on the court behavior aspect. Compared to Pospisil, Raonic’s countenance while on the court is akin to a Dalek from the Dr. Who sci-fiseries: an expressionless robot who can kill with a single use of its weapon. Show that you care, and a fan base will be all the more ready to rally around you. Raonic almost is Pete Sampras-like, not allowing the fans to let them in and give him a boost. 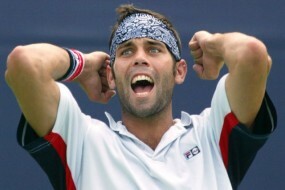 Even Sampras loosened those reins a bit later in his career, making him even more endearing to those who supported him. The young gentleman in the dining room may also have a point in terms of the players’ future prospects as well. Pospisil actually has a Grand Slam under his belt, winning last year’s Wimbledon doubles titles with American partner Jack Sock. The duo also won this year’s doubles title at Indian Wells. Three months after that success, Pospisil had his best ever singles showing at a major, reaching the quarterfinals of Wimbledon before losing a highly-competitive match to Andy Murray in straight sets. 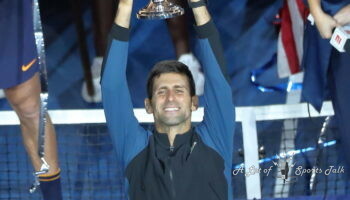 Oh, and the last time he played singles here, in 2013, he reached the semifinals. After defeating Randy Lu, Pospisil has a date with American flamethrower John Isner to begin Wednesday’s evening session. This, along with Milos’ early exit, could be a turning point in the perception of both players in the minds of Canadian sports fans. If I had any doubt that Canadians were passionate about tennis even without a legitimate tennis star emerging from the Great White North in so long, that was put to bed talking with the two young men in the dining room. 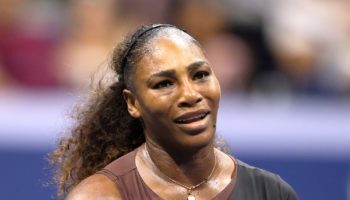 One of them even brought up the time when fiery Quebecer Simone Larose, as a wild card entry, defeated three-time French Open champion Gustavo Kuerten in the first round of the 2003 Canada Masters event. What’s also awesome is that I’m only officially three hours in to covering the event! See you all on Wednesday afternoon! Canada Day, Day 2: Sock It To Me!